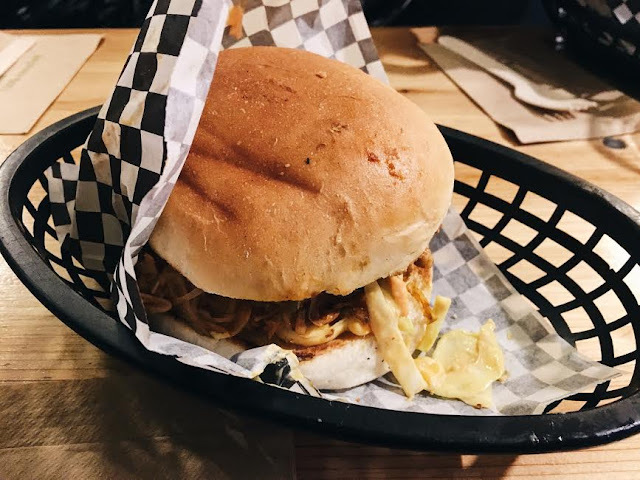 Food: Mooshies Vegan Burger Bar, Shoreditch - Daisy Chains. 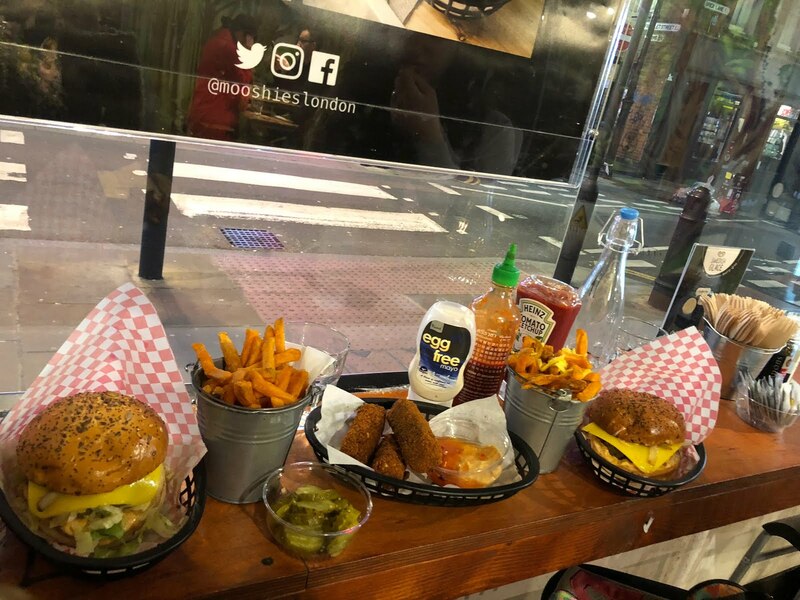 Mooshie's is a burger bar in Brick Lane that serves an array of vegan burger and other treats such as vegan cheezy nachos. I've now been twice and have enjoyed the food on both visits. 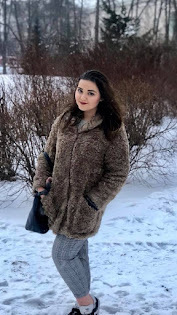 My first visit to the restaurant was quite a while ago, but I dug up the photo for this post. I remember going with my old work mates just before we were going to Junkyard Golf for a round of mini-golf. I ordered the jackfruit burger and cheezy fries- both were incredibly delicious. I for one was most pleased to see that the bun was soft and not hard or seeded. For my meat eating colleagues who also ordered this, the chew the jackfruit provided really reminded them of pulled pork. On this occasion, no one complained not even the meat eaters. My second trip back was awhile after and was mainly so that I could attempt to cure my raging hangover. This time however I ordered the 'beef' burger. Unlike most 'beef' burgers, this wasn't made out of any sort of fake meat. Instead it was nutty and full of grains. My friend did not so much like this burger as she's not into food that is remotely in any shape or form 'healthy' so the patty put her off and she has no vegetables in her burger so it's hard for her to comment on it. However, if you aren't a fussy eater and like grains then this is the burger for you. I throughly enjoyed the burger and even has the side of pickles that my friend requested to be removed from her burger. The sweet potato fries were crisp and served in a good portion. We also ordered the cheeze sticks to share which when cooled, taste exactly like real mozzarella sticks. Even my friend was fooled by them. Overall, I really like Mooshie's vegan burger bar mainly because there are so many options to choose from which are all delicious. It's so nice to see more and more 100% vegan restaurants pop up everywhere and it becoming increasingly easier for us to find options for food when we are out.